Micro Point Solutions by Cyberhair has the only solution on the market that is very natural and very safe for men and women who have fine thin hair. It is the safest, most featherweight non-invasive hair loss solution. Micro Point Solutions is the healthy alternative solution to pump up and add considerable volume to fine, thin hair. Does your hair lack fullness and volume? Have you tried extensions and found they were too heavy for your hair and didn’t give you the coverage you wanted? Has your hair been damaged from chemical processes? Have you had hair extension hot glues or waxes burn your scalp? Are you looking for a solution to your thinning hair that’s not a hair system or surgery? Micro Point may be the solution for you! What’s great about Micro Point is that there are no chemicals, adhesives, weaves, transplants, matrix or hair systems involved. It is a solution that is so natural and so safe, it is patented Micro Point Link allows us to take 4 strands of hair and link them directly to a single strand of growing hair, instantly increasing the density of that hair by 400% without causing damage or stress to the hair. The procedure can be repeated so that a person can get up to 672 additional strands of hair added to his or her own growing hair in just one hour. Micro Point becomes a part of you and will enhance the look you have without changing it unless you want to. Be as active as you’ve always been. Think about having thousands of new strands of hair to comb, brush and style. INVISIBLE SOLUTIONS One solution stands out by being almost invisible. Micro Point Solutions featuring Cyberhair by hair replacement industry leader International Hairgoods, Inc. of Minneapolis, MN has solved the problems of other extensions. Known as the “healthy alternative to extensions”, Micro Point Solutions offers patented options for fine or thinning hair. Ready For Red Carpet Nothing compares to Micro Point Solutions featuring Cyberhair. In fact, because they are so natural and practically invisible, you’ve probably seen them on the red carpet. It’s the solution that doesn’t have to be revealed. Now almost anyone with thin, fine hair can be ready for the red carpet. Problem solved! What is Micro Point Solutions? Micro Point Solutions is a non – surgical procedure for Men and Women, using a micro – mini extension. 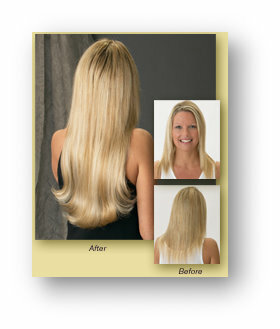 It is a light weight, comfortable and non damaging procedure that does not use glue or solvents in the application. Cyberhair Micro Point Solutions is the only extension on the market using Cyberhair, the most lightweight hair available that loves water! It is a created hair that looks and feels like human hair, wet or dry. Cyberhair is feather light, many times stronger than natural growing hair, and has moisture content and style memory, allowing you freedom to be as active as you’ve always been. Think about having thousands of new strands of hair to comb, brush and style.